This icon shows the holy Prophet Daniel in the lion’s den where he had been locked up by the instigation of jealous and wicked counselors to King Nebucadnezzar. By God’s Providence he was saved from all harm, and even miraculously was fed fresh food when an angel of the Lord carried the Prophet Habbakuk by the hair 1,300 miles from Judea. 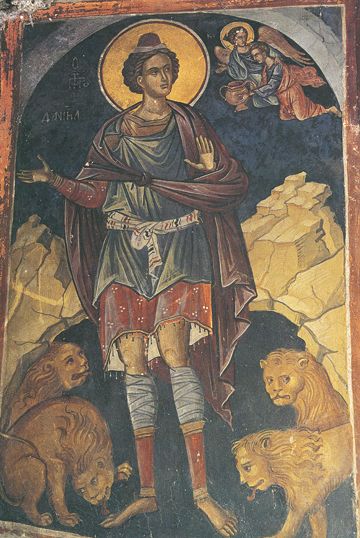 Habbakuk is shown with the angel in the upper right hand corner of this icon, and the lions, made tame by God, are even licking the Prophet Daniel’s feet. The Prophet lived about 500 b.c. and is considered one of the four Great Prophets along with Isaiah, Jeremiah, and Ezekiel. The name Daniel in Hebrew means “Judge of God,” and this is most appropriate in that he was given the power and wisdom by God to interpret correctly the dreams of Nebuchadnezzar, and also the writing on the wall which indicated the death of King Belshazzar. Made strong by God’s power and might, and strengthened by God’s love, the holy Prophet Daniel remained faithful to the One True God before kings and nobles in a foreign land at the time of the captivity of Israel into Babylon.